The most anticipated horror film of the year has finally arrived; The 2017 film adaption of Stephen king popular novel IT completely blew me away. I purposely did not read any reviews before watching the actual film, I went in with an open mind. The film was extremely gory when comparing it to the 1993 mini-series IT; which I am not very fond of. The Losers Club made up a group of the outcasted kid of Derry Bill(Jaden Lieberher), Ben(Jeremy Ray Taylor), Beverly(Sophia Lillies), Richie(Finn Wolfhard), Mike(Chosen Jacob), Eddie(Jack Dylan), and Stanly(Wyatt Oleff) must come together to fight their worst fears that are puppeteered by Pennywise the dancing clown(Bill Skarsgard). I loved every aspect of this film; IT is a perfect combination of comedy and horror which some may view as a flaw, but I consider it an advantage. When I say the film was funny I don’t mean it is so bad it’s hilarious rather, the comedy comes from the friend’s relationship with one another. Their commentary is absolutely perfect. The acting across the board was phenomenal when watching kids on screen its a hit or miss, either they have this amazing raw talent or it’s just cringing fest on a huge screen. Fortunately, all of the child actors were incredible. You could really feel the bonding and friendship they kids had on screen, particularly Richie(Finn Wolfhard) whom also stars in Stranger thing and Eddie(Jack Dylan) these two characters gave so much life to the film; their performances were the ones that lingered once the screen went black. The Losers Club greatly reminded me of the friends in E.T, Stranger things, and Stand By Me. Except in IT, Pennywise the clown will only show himself when he wants to be seen so no adult will believe the kids; they essentially only have each other. This also what surprised me in this film, the parents are pretty much absent in the lives of their children and the two parents who have more screen time are horrifically disturbing. Because of their absence, the film develops an underdog spirit; these kids are on their own against a malicious clown they can only see. Speaking of the clown, Pennywise is played by Bill Skarsgård in which my opinion is a significantly underrated actor. Being constantly compared to Tim Currie’s 1993 Pennywise Bill Skarsgård version had a lot more depth to him. Overall the real test is if Pennywise fits in the film and Bills Skarsgård clown defiantly does, he is terrifying. There is a particular scene where Pennywise is squatting in-between long grass beside a pond waving an eaten human arm. Out of all the scenes featuring Pennywise, that is the one that stuck; that specific shot is disturbing on so many levels. Bill Skarsgård had some big shoes to fill and he filled them to the brim. 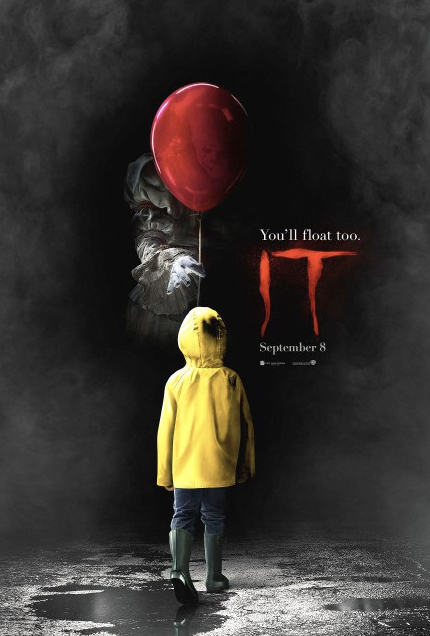 Director Andy Muschietti does a fantastic job with this film, it looks great, the editing is flawless, and the incorporation of CGI was seamless. It seems as though there will be a chapter 2 about the kids as adults, exactly 27 years after their first encounter with Pennywise the Dancing Clown. If Andy Muschiettie and writers Chase Palmer, Cary Fukunaga, Gary Dauberman continue to work on the next film I am here for it. IT is composed of amazing performances, a terrifying villain, relatable characters and a compelling a story that only gets strong her as the film progressed. There were no dull moments in this movie. Starting off with a little boys arm getting bitten off and dragged into the sewers the film only grows stronger from there. IT is an incredible horror film that is worth all the hype. Watch the trailer here.